This HD surveillance video demonstrates the day and night time infrared capability of the HD-TVI-BL180 TVI security camera. This is 1080p high definition video surveillance captured using an HD-TVI security camera with an ultra wide angle fish-eye lens. CCTV Camera Pros has this camera mounted to the ceiling of our sales floor and it is hard wired to an iDVR-PRO recorder using RG59 coax cable. The DVR is configured to record video 1080p resolution at 30 frames per second. You can see here that the 180 degree lens is able to capture video of me even when I am standing directly below where the camera is mounted. This wall is 15 feet away from the camera. And the room is just over 28 feet wide. Here is another video segment that we captured to show the infrared night vision capability of the camera. When the lights are on in the room, the camera captures surveillance video in color. This room is 28 feet wide by 28 feet deep and the camera is mounted 9 1/2 feet high. When I turn the lights off in the room, the camera engages it’s built-in infrared LEDs so that it can capture video in the dark. I use the flashlight on my iPhone so that I can make my way back to this spot. This room is completely dark right now except for a dim red light on the emergency exit sign. When I turn the lights back on, the camera turns off its infrared and switches back to color / day-time mode. The HD-TVI-BL180 is a 1080p resolution TVI security camera. The camera’s fisheye lens captures a 180 degree field of view. The 24 IR LEDs that are built into the camera have an effective infrared range of 32 feet. 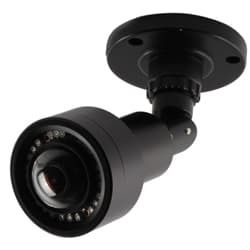 The camera housing is IP66 rated which allows it to be used to indoor and outdoor video surveillance installations. The tri-axis mount of the camera allows this camera to be ceiling or wall mounted. IN addition to TVI video support, this camera also has analog CCTV, CVI, and AHD modes. A 12V DC power supply is included. For current pricing and more information, please visit www.cctvcamerapros.com/BL180. Click here to learn more about the HD-TVI-Bl180 HD-TVI 1080p CCTV Security Camera used in this video.